Morning briefing was cancelled by SMS before we left the accommodation due to heavy rain so the competition standings didn’t change. Congratulations to Uwe Schneider on his win. Three baggies and a task sheet with five task met the pilots at briefing this morning. CRT, HWZ, FON, (where you had three preselected goals from the director to choose from) ELB, & a logger FON…although the ELB and last FON could have been flown in any order. Time could be an issue as the scoring period for all the task ended at 9am when the winds were due to increase. The CRT consisted of a circle around the cross with two pie portions north and south. The pie portions were open for scoring all the time but the rest of the area was only open for 5 mins every 15mins so timing your arrival to the goal could prove critical. The morning winds provide a good 80 degrees of steerage so I would expect some good scores at the first three targets where the distances would be measured by baggies. Each approach required a climb to about 1500ft to pick up the SE wind and then a drop down to the surface to ride the easterly wind to the target. I elected to fly my final FON prior to the ELB. To declare the goal you had to make sure it was at least 2km from your declaration point and that you declared a height at least 1000ft either higher or lower from the height you were at when you declared the goal. When I climbed to 1600ft to get the SE wind from the HWZ goal to the FON I declared my final FON just north west of my first FON at a height of 400ft. The good steerage should have allowed for good results on the final FON….the only issue would probably end up being the pilot to machine interface where people would make silly mistakes. There were never any winds to allow for a box condition so the ELB results were never going to be outstanding. Pilots who were luck enough to find a hill to fly around or a valley to tuck into will probably get the best results. Check the web page for the results. Forecast for the evening is looking a bit quick. With two baggies on the table the task sheet showed two task…a FIN and FON. The only fly in the ointment was the gusty winds which according to the met man should have die down by flight time. Unfortunately this was not to be the case and 10mins prior to the start of the launch period the director sent out the SMS cancelling the flight. Weather for the morning is looking good….or so they say. Morning rain as we drove to briefing was the clue as to why it had been delayed by 2 hours. However with four baggies on the table there was an expectation that perhaps the weatherman was going to wave a magic wand and the skys would clear. The lack of task sheets said otherwise! Current standings but Uwe Schneider way out in front with 6284 points about 1300 points ahead of 2nd place. But then it’s all very tight with only 200 points separating 2nd place from 6th, and 300 points to 9th. Weather conditions for the evening flight looked good for as we drove in for briefing. But light winds were going to be another major factor. The tasks sheet consisted of two HZW task utilising the same five targets for both task with the proviso that you had to score at two separate targets to get a score for both tasks. The pilots drove out to the common launch point 1 to await the green flag. Grey clouds seem to be moving in from the west. 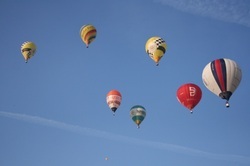 At 1830 with green flag the winds started to get gusty as the balloons rolled around inflating. It was a very narrow steering band of winds so it was important to stay close to the approach track right from the get go. Because of this most of the balloons missed the first target to the right. Half a dozen pilots managed to hit the cross with the rest being outside the MMA. Approaching to the second HZW was similar to first. But with the winds shifting to the west and sprinkles of rain from the sky, as the balloons approached the target most pilots once again missed it to the right, with only a handful getting inside the MMA. Forecast for the morning looks reasonable but wind and weather is suppose to be heading our way. It was an early 5am start for the 24 German pilots and 1 English pilot taking part in the 2013 German Nationals. It was obvious from the drive in that there was little or no wind and this was confirmed by the lack of wind date given out at briefing. Comp director, Claude Weber and his team handed out a 6 part task sheet consisting of a FIN, WSD, WSD., Logger FON, FON finishing with a LDR. First order of the business was to cancel one of the WSD because the winds were extremely light. Most pilots chose to use the 800ft winds into the FIN. 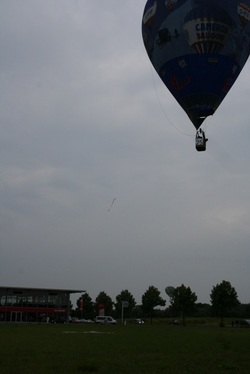 With them having to launch at least 1km from the goal it still took over 30mins to get to the target. During the approach to the first target the hare balloon launched and promptly climbed to altitude and flew over our heads heading south. The steerage into the first target was constant and reliable but required pilots to fly slightly past to pick up the lower winds and come in from the west. Good scores were evident from the scatter of baggies within the legs of the cross. Following the hare for the WSD required a climb to over 2000ft. But the wind to the south was slow giving many pilots time to do at least one of their logger FON task. You had to fly at least 2km from your declared point to your goal and be at least 1000ft above or below the altitude you were at when you declared the goal. During the approach to the WSD target the light winds were become a little more fickle and unreliable. Only 9 pilots managed to score within the MMA of 30m. It was then onto either your last FON or the LDR. The consistent light winds and the 30 min LDR time period meant it was hard to get a massive score. However many pilots marked they final point just short of the edge of the map thinking they had a reasonable score only to discover that they were given a NO RESULT because the competition flying area was inside the last grid lines. One pilot told me he was very luck because his time ran out 1min before the final grid line. Otherwise he would have made is last point at the edge of the map.